John Quincy Adams once said, "If your actions inspire others to dream more, learn more, do more and become more, you are a leader. " It is to these word that I have tried to live, doing my best to inspire in others, what my heroes, inspired in me. And I feel more than ever, this is what's needed in our country; not new laws or taxes or controversy, but inspiration. We need to show the up and coming generations a vision for the future. And so I'd like to take a moment and show you what I envision. An end to the oil crisis. 'But how?' you ask. The answer is simple. Free public transportation. No more cars and trucks spewing out harmful emissions. But a world where man, woman and child, ride safely to their destination on the backs of a brimming stegosaurus population. 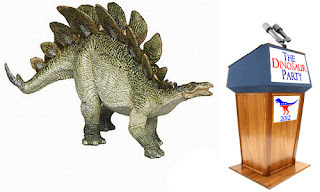 Not only would it be beneficial to the environment, and cost efficient, it would also create new jobs for all the unemployed Stegs [stegosaurus] out there. And if selected as your candidate, I will tirelessly work towards this goal, reaching out to other dinosaurs like say, the DOT. Had to get that one in. But in reality, I foresee a world not just of stegs driving, but of pterodactyl, flying us to our destinations, and the plesiosaurus, taking vacationers out on the water like a cruise boat. The boundaries are only set by what we limit our imagination to. Of course I know there are practical concerns that arise immediately. Let me assure you that what scientists had not figured out with their studies is that the spikes on our backs are completely removable. Most of us only wear them on special occasions or when we are called to war. Outfitting our backs with seats is no problem at all. I hope I've inspired the children out there as well as those young at heart, to dream big. Remember, later, when you're voting for a candidate, with the stegosaurus, you've got a ticket to ride. I'd join this party. It is more based in reality than the parties we have now. But who will clean up the dino poo in the streets? Or is that part of the more jobs program? I would vote for Phil A. Buster. @Belle, Plus dinosaurs learned the hard way what mistakes not to make. @Alex, He didn't specify, but that's a good question to pose when it's time for the debates. @Budd, He's just the first potential candidate. But I'm sure he appreciates the early support. @Kal, I'm sure he must be aware of the irony. Another reason perhaps to go steg for transportation? Less desecration of their graves? In this wonderful world you created the dinosaurs wear suits and read from teleprompters. Promise me that the T-Rex have invented those little extention reachy thingies that old people use to get tin cans from high shelves. LOL...I was going to address the comfort issue with those spikes, but I see you've got that covered, too!! I've never been so ready to place my vote. When do the polls open? Oops, guess I got a bit overzealous. There was a reason the country dwellers feared visiting cities when horses(taking up far less space, mind you)ruled the stone roads. Free public transport only works if it delivers people right to the their door. @Marlene, they do their best to cover the bases. @Robyn, Overzealousness is welcome, but wait till you've seen the rest of the candidates. @Rek, These are all good questions. Hopefully he'll have answers in the future when a forum is held. @Enid, I suppose he was generalizing a bit. Not everybody could take advantage of the system. I just want to know who is gonna clean up all the stego-poop? @Kal, Well you know, what better consultant could I go to than someone who lives in a cave? Obviously you know Dinosaurs. You might like this, the slogan we have on the facebook page is "if the world ends in 2012, you'll want a leader who's been through it before." I must admit, I got lost in the speech and was really interested in the proposed free public transport solution. I thought there might be something to it, and there was, a great dinosaur joke. I would love to ride a Steg. Will there be seat belts?